How To Batch Rename Files Or Change Extensions At Once In Windows:- Batch renaming files can be easily accomplished with the help of our own Windows explorer. Also, you can change the extensions of multiple files all at once using the command prompt. In this article, we have explained both these tricks in a very simple way with clear screenshots. Hope you find the article useful. You can batch rename files in Windows using a very simple method. Here, you can specify a new name for the files and the files get renamed accordingly. The limitation is that you cannot give seperate names while batch renaming. The files get renamed in a progressive fashion. Let’s say you have a folder full of files that you want to rename all at once. In my case, I have a folder named renameFiles which has all the files that need to be renamed. Select all the files. As next, click on the Rename button as shown in the screenshot. Or you can simply press the F2 key. Another option is right clicking and choosing the Rename option from the context menu. This will highlight the name of the first file in the selected set of files. Type in the new name with which you want all the files to be renamed. Hit enter key. Now you can see that all the files are renamed at once. You can change the extensions of multiple files at once by using the command prompt. For example, you can change the jpg files to png files, text files to html files etc with a single command. Right click on the folder that contains the files whose extensions need to be changed. While right clicking, make sure that you hold down the Shift key in your keyboard. 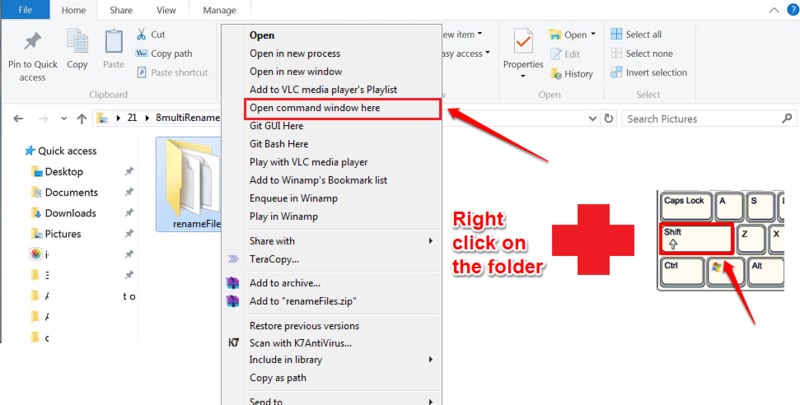 From the context menu, find and click on the option named Open command window here. This will open up the Command Prompt. It will be opened at the folder that has all the files. 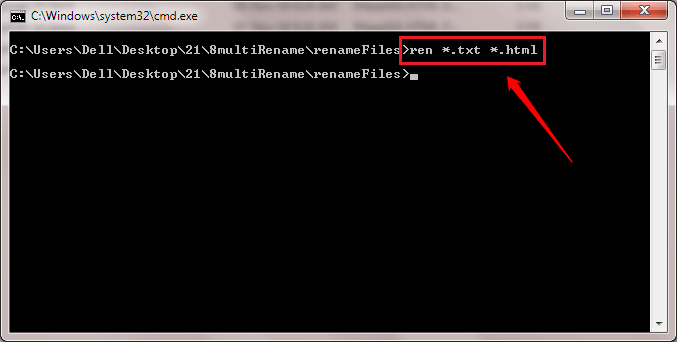 You can type in the command ren *.extension1 *.extension2 to change the extensions of the files all at once. ren is the command word for rename. *. indicates that before the . (dot), any number of characters can occur. extension1 is the extension that you want to change. extension2 is the new extension to be used. Now if you have a look, you can see that all the file extensions are changed. In my example, I have changed all my text files into html files. If you have any suggestions or doubts, please leave comments in the comments section below. Thank you for reading the article.